Researchers in Spain have developed a new contrast agent for magnetic resonance imaging (MRI) based on functionalised magnetic nanoparticles that could work as a biomarker for early diagnosis of Alzheimer’s disease. Their work could pave the way for new studies that develop methods of early and noninvasive diagnosis of this neurodegenerative disease. Alzheimer’s disease is a progressive neurodegenerative disease that affects about 47 millions of people worldwide. Today, the definitive diagnosis of this disease is only possible after the death of the patient, when clinicians can determine the presence of tangles and amyloid plaques located in the brain parenchyma through histological techniques. The current diagnostic practices include evaluations of the patient history to detect behaviour changes and neuropsychiatric and neuroimaging evaluations that provide a probable diagnosis of Alzheimer’s disease. At present, biomarkers provide neither a high accuracy of early diagnosis of the disease nor a suitable monitoring of the progress of the disease after using radioisotopes. Therefore, researchers are looking for new biomarkers that detect the presence of Alzheimer’s disease using noninvasive methods. The presence of iron deposits in the brain is a histopathological characteristic of patients with Alzheimer's disease. 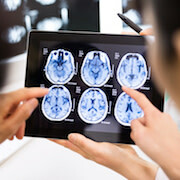 However, the need for high concentration of accumulated iron and the extended periods of time to obtain the images through MRI make it difficult to use this technique in patients for the early detection of this disease. 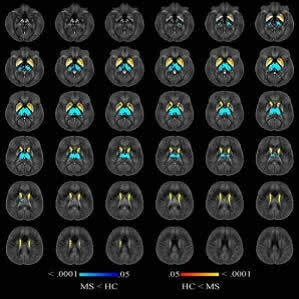 It is therefore necessary to develop contrast agents that can be used to achieve greater sensitivity in MR imaging for the detection of incipient iron accumulation associated with amyloid plaques in the brain of patients with Alzheimer's disease. In order to make progress in the search of noninvasive biomarkers for early detection of Alzheimer’s disease, Dr. Milagros Ramos-Gomez from the Centre for Biomedical Technology at Universidad Politécnica de Madrid, led a team of researchers from Severo Ochoa Molecular Biology Centre (UAM-CSIC), Universidad Carlos III, Gregorio Marañón Health Research Institute (IiSGM) and CIBER of Mental Health (CIBERSAM) and CIBER of Bioengineering, Biomaterials and Nanomedicine (CIBER-BBN). The research team discovered the presence of accumulated iron and the protein that stores iron (ferritin) in a hippocampal area of transgenic mice for Alzheimer's disease. These accumulations of iron and ferritin are observed around the amyloid plaques which are characteristics of the disease. This finding helped the team develop a contrast agent for MRI based on the functionalisation of magnetic particles with an antibody that recognises ferritin. Thus, the researchers showed that, through histological analysis, the new nanoconjugate binds to the ferritin accumulation in a particular way in transgenic mice for the Alzheimer’s disease. Image Credit: ACS Chem. Neurosci. MRI, nanoparticles, Alzheimer’s disease Brain section of a transgenic mouse for AD showing accumulations of amyloid plaques (green) and ferritin (red).